Life can turn into auto-pilot roller coaster. We have so many “musts” that we often forget how that may impact our body, our self, our health. Thankfully, this body of ours has the amazing capability to cope and heal. But it does have its limits. It will start talking to us (in ways it can: those stress, unhappiness, easily irritated moments; escalating to illness: headaches, flu, stomach ache, stiffness; escalating to more serious illness (god forbid)). By spending some time regularly to stop and listen to the body, we will have better idea on what’s going on, and–like a child that feels heard–the body will start to heal. Let’s give our body its due respect. Let’s listen. That’s what health meditation is basically about. To listen to how we are, and provide us a chance to heal. 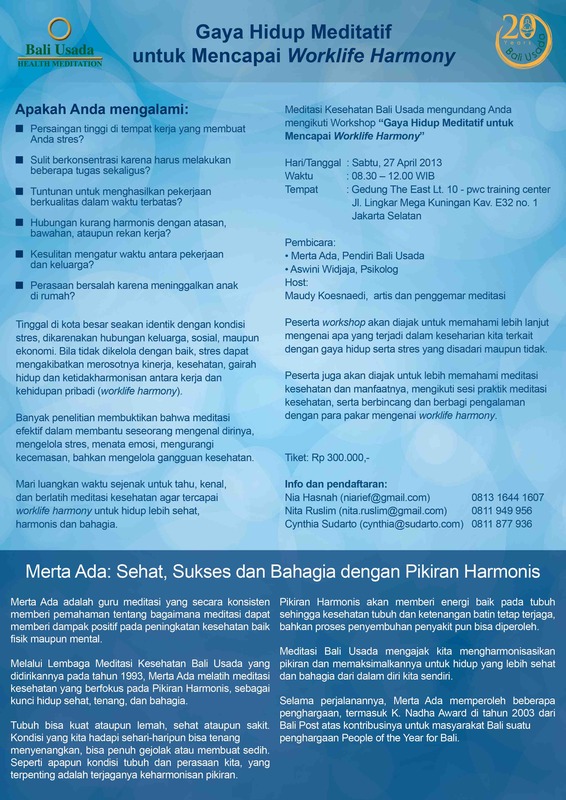 Jakartans, there is a half day workshop conducted by Bali Usada on health meditation on April 27. Let’s use this opportunity to understand how the body (and thoughts, emotions, feelings) works and help it heal. This entry was posted in Bali Usada, occasion on March 20, 2013 by Eva.